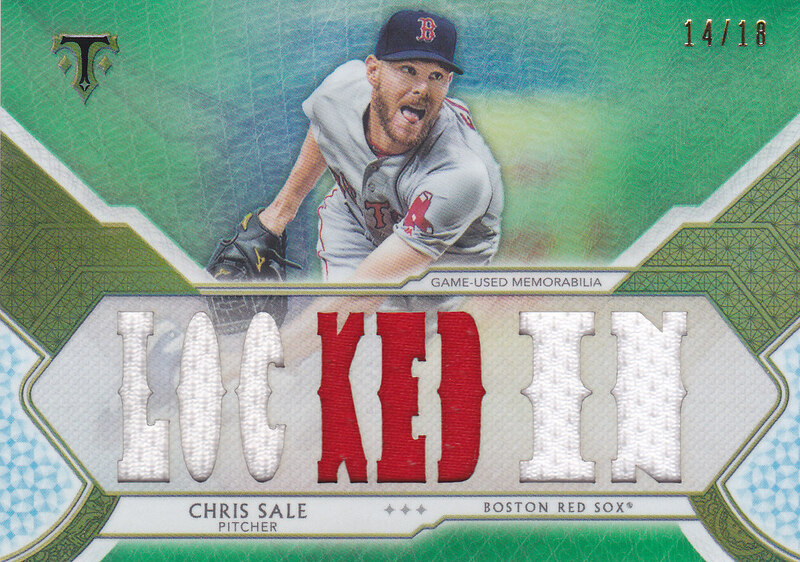 Topps has made tremendous strides to push 2018 Topps Triple Threads Baseball to stand out more than ever before. The baseball card giant has improved the base card finish while upping the ante on the autographs and relics to polish one of their best high-end releases. 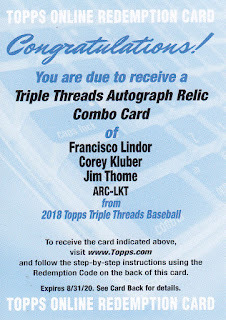 The two mini-box configuration of 2018 Topps Triple Threads yields 14 cards – two autographs, two relics, four parallels, and six base cards. While most collectors are going to breeze past the base cards in search of the autographs and relics, I urge those opening a box to slow down and enjoy the base cards, which are far from ordinary. Upon closer inspection, one will find a nuanced design that features a gold embossed trim and an ultra smooth finish, all creating a card that looks and feels like no other on the market. 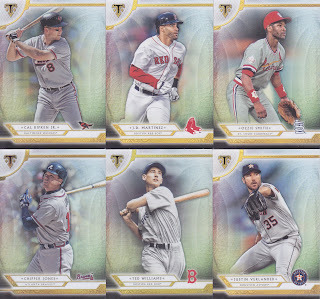 While one is busy admiring the fancy base card designs, 2018 Topps Triple Threads fashions colored parallels in the same mold. These cards are named after precious jewels, only serving to further the set's premium motif. 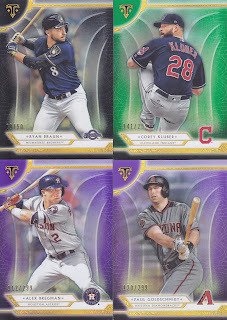 Lucky collectors will feast on Amethyst (#/299), Emerald (#/259), Amber( #/199), Gold (#/99), Onyx (#/50), Sapphire (#/25), and Ruby (#1/1) toned parallels. The box provided for this review drew the following parallels as displayed below. 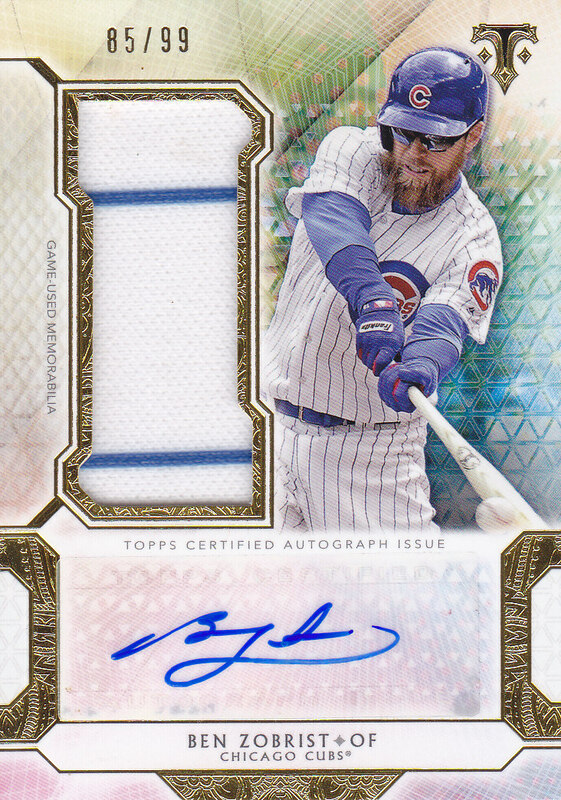 With a price tag of $200 per box, collectors opening 2018 Topps Triple Threads have good reason to anticipate the intricate relic and autographed cards. 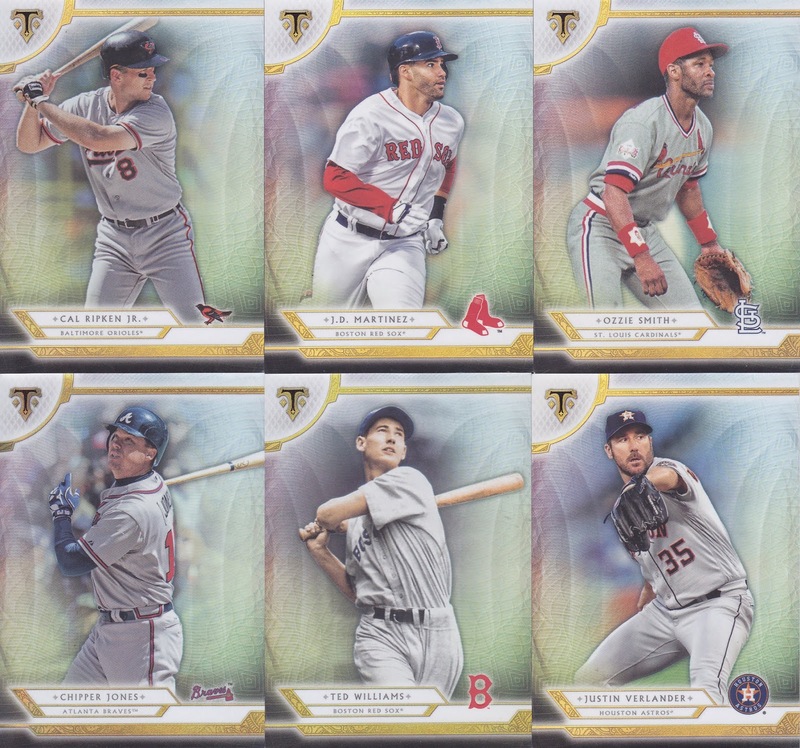 Just as Topps paid great attention to the set’s base cards, each master box’s four major hits are styled in a manner that commands a premium in both price and attention. This box's hits would surely excite Chicago Cubs fans, with a Ben Zobrist autographed relic, and an Anthony Rizzo jumbo relic card. 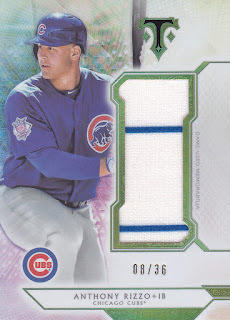 Most fans would be quite content pulling those hits from any Topps product; however, those were only half of the excitement. 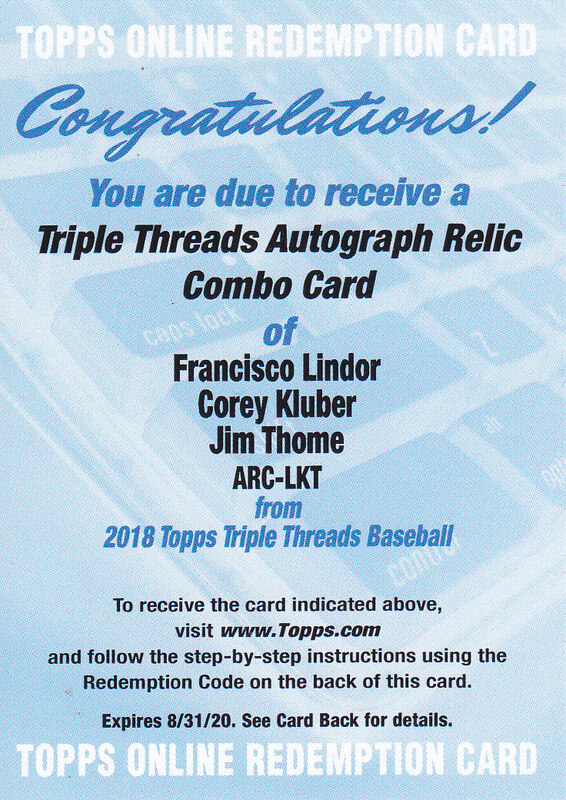 We were also treated to a two-toned Chris Sale “Locked In” jersey relic card, and the saving the best for last, we pulled a redemption card for a triple-autographed relic of Cleveland Indians Jim Thome, Corey Kluber, and Francisco Lindor. Topps Triple Threads comes right in time for a holiday treat. 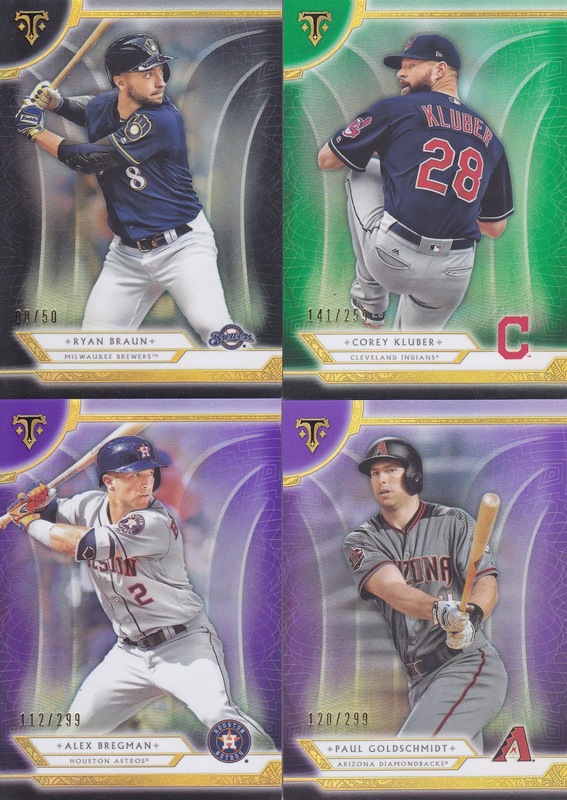 Topps’ adjustments to the card design and stock show that they are not willing to rest on the product’s premium hits to enhance the collecting experience. 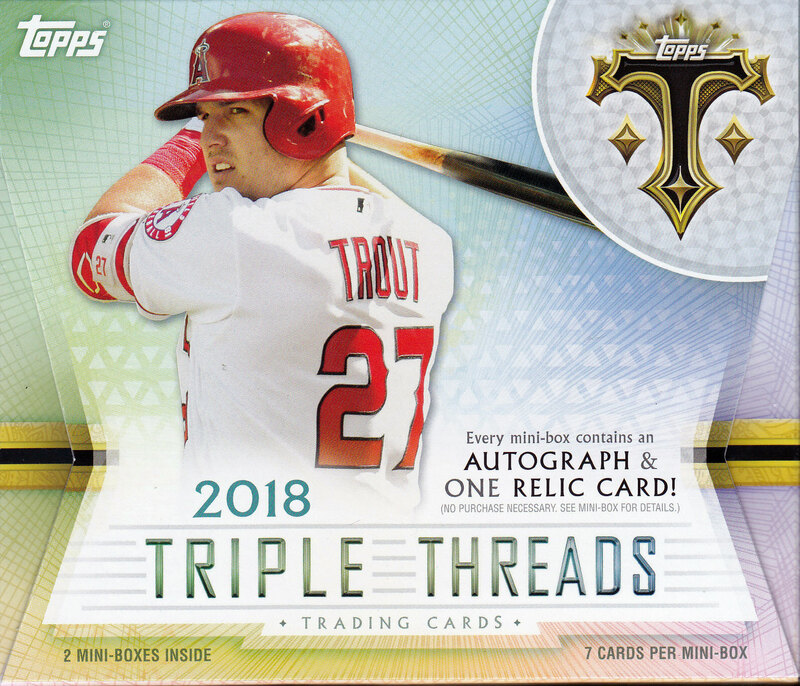 Whether it is for yourself or a special collector in your life, adding a box of 2018 Topps Triple Threads Baseball to your shopping list will deliver a thrill for the winter months.